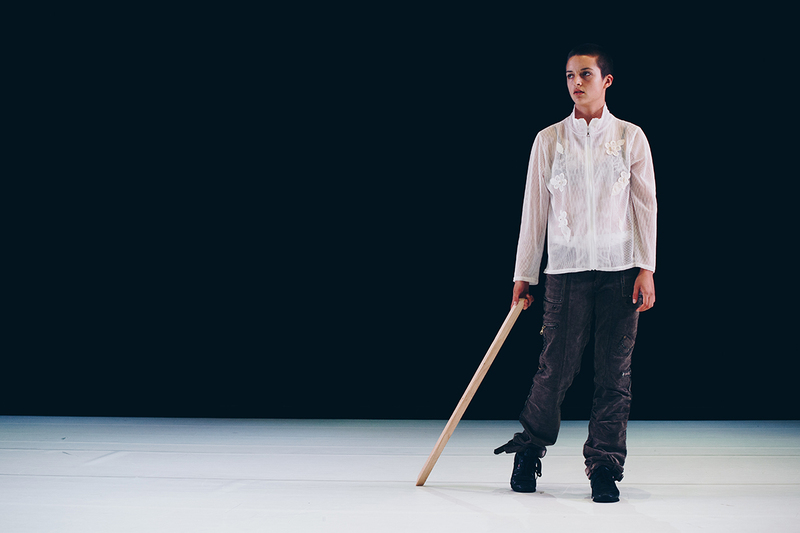 Despite its provocative title, referencing Valerie Solanas’ Scum Manifesto of 1967, which advocated the elimination of the male of the human species, and the invocation in the performance of the Wilis, the ghosts of betrayed young women in the ballet Giselle (1841) who force men to dance to their deaths and throw their bodies in a lake, Scum Ballet is largely contemplative, focused on female being, imbued with a sense of ritual and magic and endowed with symbolism that is variously literal and elusive. Five casually attired female performers stand in a cluster on a stark white floor, expressionlessly regarding the arriving audience. They exit to appear in various locations on the grid high above, leaning or seated, legs swinging, looking down on us. In a sustained blackout they fragilely harmonise a gently melodic, wordless chant. As our eyes adjust to the dark, the voices draw closer and we see shadowy figures crawling onto the floor. The careful shaping and the sense of time suspended at the beginning of Scum Ballet transport us to what will prove to be a most unusual realm. In the ensuing scenes, the women configure themselves in ways that largely suggest a deep unanimity, at first seated in a diagonal across the space, gently sliding, touching, reversing direction, pairing and resting heads across each other’s shoulders before once again gazing at us. An early exception to this togetherness arises in the subsequent scene performed against music that threatens with heavy beats and the startling crash of metal and glass. While others watch, performers face off in successive, circling pairs, dragging long strips of wood — weapons never wielded and only borne when wearing the heavy trousers the performers take turns at sharing. It’s a strange ritual, the tension heightened by the intensity of locked gazes, arms loose but bodies in readiness and a slow, heavy pace barely varied. Is this a ritual refusal of violence? Are the trousers adopted meant to represents a male animus? Blackout and the sound of sticks dropped. The sense of threat returns. 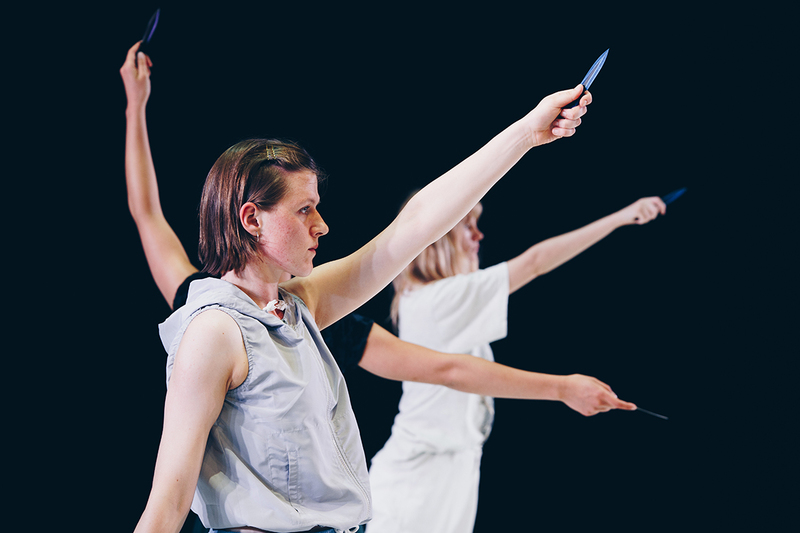 The performers collect short blades, ply them between their fingers, modestly evoking Edward Scissorhands or Wolverine, and, gathering, seat themselves centrestage in an engaging, slow-moving tableau of touching and stroking. The painterly image successively suggests power, danger, intimacy, care and fond togetherness. Subsequently the dancers adopt loosely balletic poses, the blades now eerily extending the natural gestural reach, a variation on the power of Giselle’s Wilis? A burst of song, percussion and roaring drives the performers across the stage, each adopting a distinctive shape, step or momentum — together but apart. This brief surge, later repeated, is quickly countered by formal balletic groupings, three dancers to one side, two to the other in an evocation perhaps of the Wilis but without any intimation of threat, or perhaps it’s simply an expression of harmony through formal dance. An ensuing cycle of intensely coloured lighting cast across the empty stage is attractive but indecipherable, perhaps designed to extend the calm before a new mystery emerges in a scene that suggests ecstatic ritual. The dancers carefully build a large mat from interlocking segments, on which they sit close in various positions which allow them to each discretely bounce with rapidity and force, Angela Goh facedown, fully extended, body rippling and pounding like a caught fish. This strange violence is self-inflicted but is also a collective expression of strength and considerable endurance, recalling and contrasting with the earlier image of the tender stroking with blades. I did fleetingly wonder if this floor dance correlated with the men danced to their deaths in Giselle, but the connection was slender and identification with the men seemed unlikely given the “scum” in the work’s title. The mind is busy when engaging with image-based works. Finally, venturing a kind of magic, the performers slide the mat about while one of their number slowly traverses it, all the while our expectation building that the segments will disjoint beneath the weight of the body; they don’t. Scum Ballet might not offer the kind of dance that defies gravity with propulsive steps and giant leaps, but the deeply earthed pounding of the previous scene and the victory over friction in the next exhibit in different ways dancers’ capacities to unsettle expectation, here in the service of metaphor-making to illustrate female strength through collaboration. A similar, perhaps less necessary and less collective, though dextrously executed, routine follows using a door-sized plank in place of the mat. In the end, there is darkness and song, lines gently overlapping, the ritual completed. Though from time to time experienced as a series of disparate images, welcome in their strangeness, Scum Ballet coheres more memorably on recollection. 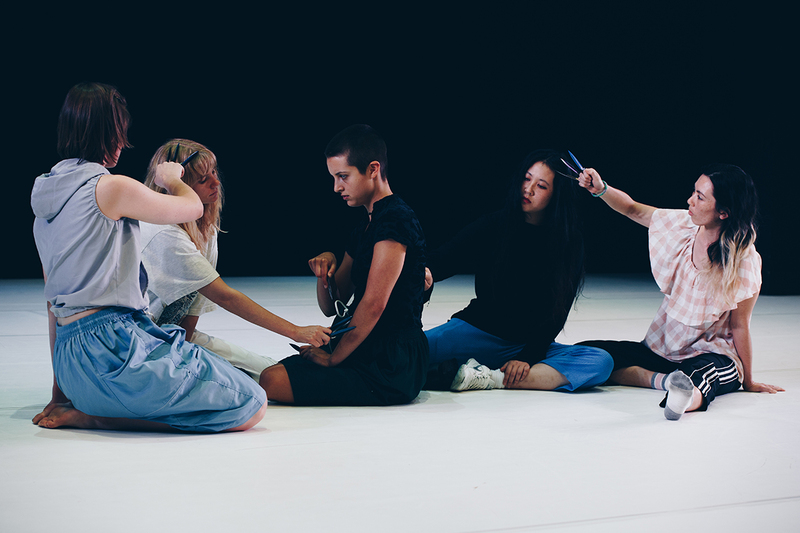 The strength of female collaboration is evident in strong performances that exude the sense of building “intimacy, love, care and magic between us” that Angela Goh writes of the work’s making, but it’s made even more fascinating by the tensions and ambiguities conveyed in the most potent of her images. 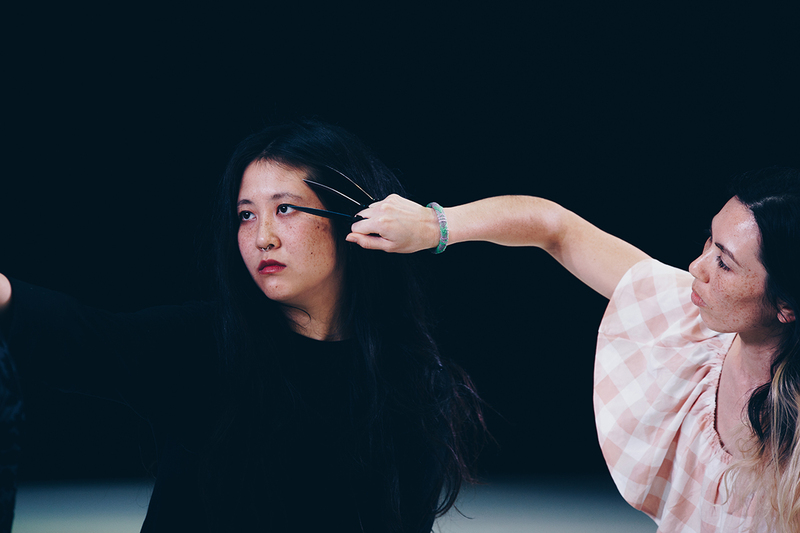 Angela Goh’s intruiging solo work Desert Body Creep is programmed for New York’s PS122 13th Annual Coil Festival, 10 Jan-4 Feb, 2018. Read reviews by Elyssia Bugg and Alison Finn of its 2016 Next Wave premiere.